India 'A' succumbed to a hefty defeat at the hands of a rampant India 'B' team in the Quadrangular 50-over tournament. Opener Mayank Agarwal continued his remarkable form by hammering a rapid century at the KSCA Ground in Alur. Upon electing to bat first, India 'A' ran into early trouble as they lost both their openers within the first ten overs. Captain Shreyas Iyer soon followed suit to leave his team reeling at 45/3. Prasidh Krishna utilised the new ball splendidly by picking the first three wickets to fall. Aside from Ambati Rayudu's 48, none of India 'A' batsmen was able to make any sort of impression on a tricky surface. Chasing 218, Agarwal put on a stellar exhibition of stroke-play. His 124 from just 114 balls comprised 14 boundaries and three sixes. 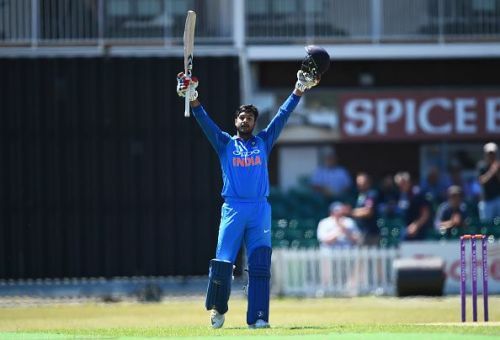 The 27-year old's century propelled India 'B' to a comfortable seven-wicket victory.